I now have a mannequin; actually I have two in my house. A store that is going out of business is selling off the mannequins and I decided I needed one for myself. The second is actually for the school for our dinner auction. I’m just storing it at my house for the moment. Because I’m too lazy to bring it into the office. Because the closet in my office needs to be rearranged. Because I haven’t found a place I’d like to keep it yet. I don’t know which one to store! Well, I’ve got a whole list of excuses why I have the two mannequins still hanging around my house. The funny part about the mannequin is that my husband came home from work one night to find two necked mannequins in the living room. He just looked at them and said, “oh, you got a mannequin,” in a bored voice. I’m somewhat disappointed at such a lackluster reaction! 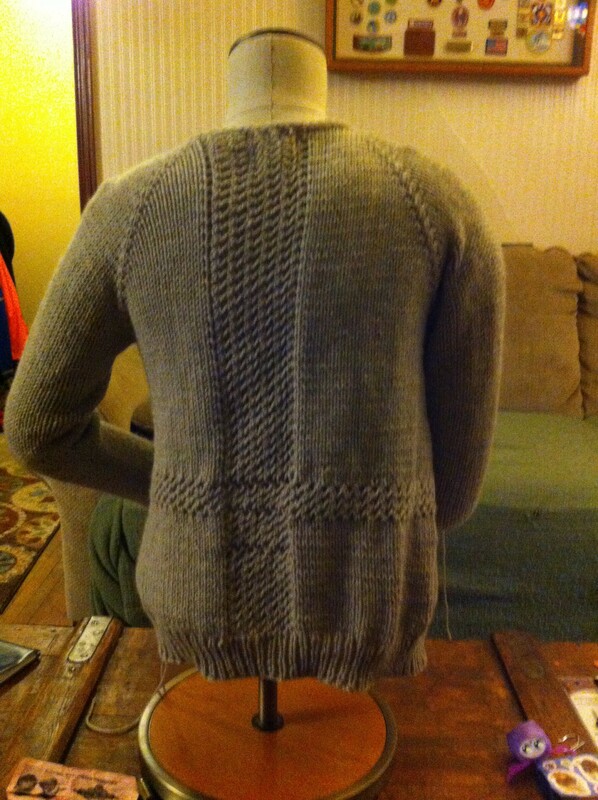 The mannequin arrived just in time to model my partially completed Sandshore Cardigan. 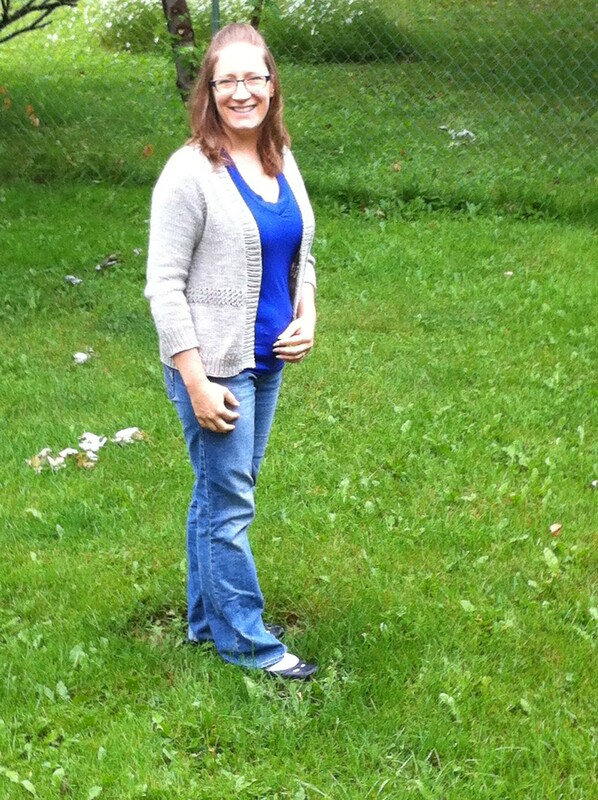 The Sandshore Cardigan is Project #2 for Camp Loopy. It needed to be a project that reminded us of our favorite place to relax or vacation. I absolutely love the shore. Whether it’s the shore of Lake Superior, the beach at the cabin, the sandy shore at Sanibel Island, or any of the other shores that I have visited. I love watching the waves and having my toes in the sand. Needle: Size 8 – I went down 2 needle sizes for this. Modifications: I did a Make 1 instead of a yarnover at the raglan increases because I didn’t want the holey look at my shoulders. I also made the sleeves full length because I think I’ll get more wear out of the sweater this way. 3/4 length sleeves just don’t seem very practical for Superior. This sweater is perfect for chilly nights on any shore. It’s great over a dress when the air conditioning at a restaurant is kicked up a little high. I haven’t even blocked the sweater yet and I’ve worn it twice! Back to the mannequin, I think I need a name for her. I’d really not write another post with the word mannequin in it 30 times. Do you have a suggestion as to what I should name her? Post it in the comments below! Only when you’re Up North does a blanket made out of hundreds of little wool hexigons with stuffing inside seem like a perfectly reasonable (and useful) gift to give a baby. Only when you’re Up North does the weatherman say that we’re going to be “warm” this week when the weather is going to to in the 20’s F during the day. (that’s -2 C for any of you Canadians). And yes, oddly enough the sun did feel warm. Only when you’re Up North do you drive south to visit your family’s cabin. Only when you’re Up North do you see children dressed like this. What’s missing is her usual “double layer” hat. 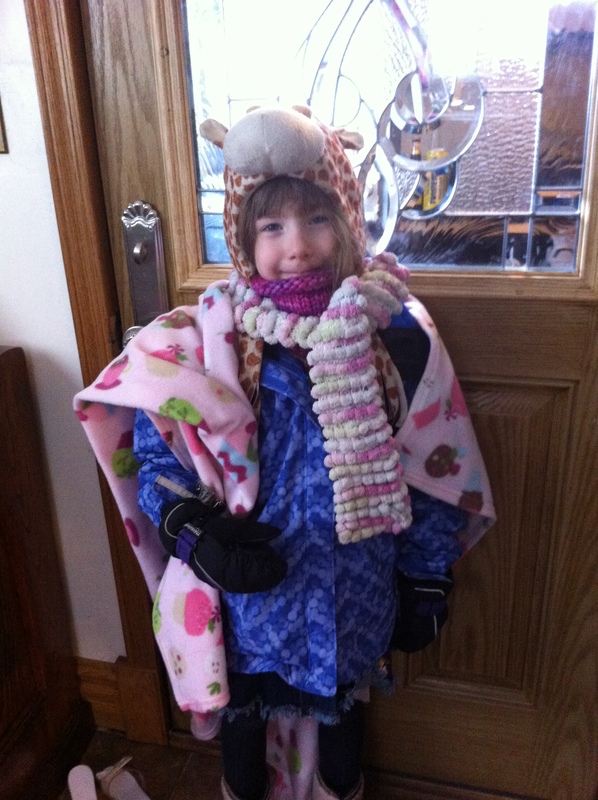 She likes to put her knitted wool earflap hat on first with the giraffe hat over the top. Edited to add: WordPress just ate my blog post. It was long, it was clever. I waxed poetic about the Pope visiting and the fact that Zac Efron never will. I even made resolutions. This is all that is left. I’ve spent a lot of time the last week or so thinking about what I would like my New Year’s Resolutions to be. 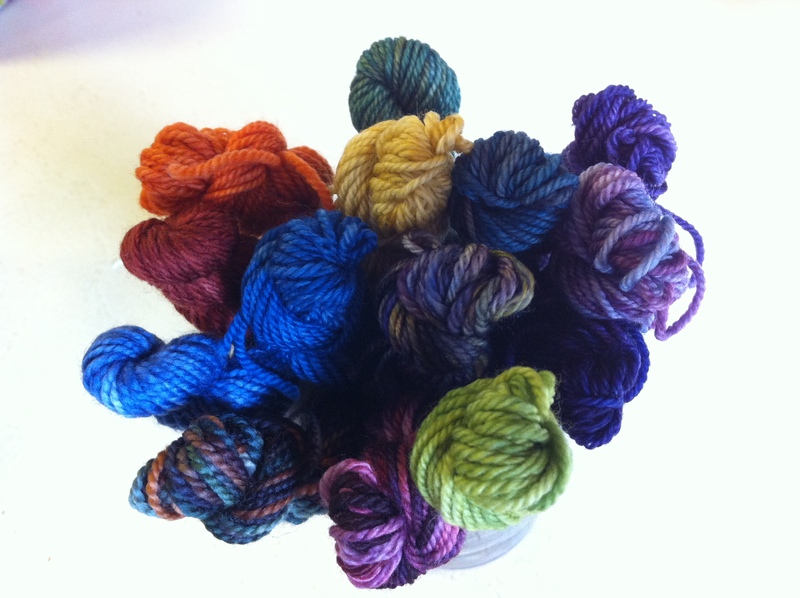 Specifically, what was I going to put on the blog about Knitting Resolutions. For a while I thought I’d skip the whole resolution thing and just do a Top 10 of Knitting Things to Do this year. I thought about a recap of all most of the sweaters I knit in my 12 in 2012 challenge to myself. And then I got kind of down on myself. See, I didn’t knit 12 sweaters in 12 months. By my book, that should be a FAIL. But wait, I’ve got a couple of cool sweaters out of the deal. I made sweaters for gifts. I have 3 almost done sweaters on the needles. So… that’s not really an epic failure. I have even caught sight of 2 sweaters I made for our new nephew being worn. That’s more like a pretty cool year. I think I will do a recap of the Year of Sweaters, but not today. Today, it’s about resolutions. Besides, there are stores that could possibly be dependant upon my yarn budget. I couldn’t possibly put them out of business! 🙂 Plus, for the first time I signed up for the Blue Moon Fiber Arts Rockin Sock Club. I cancelled another club that I was in so that I could justify this one. I’ve looked at the Rockin Sock Club for a long time. The thing that strikes me with their yarn is that often the color combinations are not what I would choose. However, once knitted up, they are amazing. I have been really impressed with their yarn and I’m looking forward to this one. Author knittingupnorth2015Posted on December 27, 2012 Categories UncategorizedTags blogs, socksLeave a comment on Happy Festivus! Dashing through the snow on a pair of broken skiis, crashing into trees, the snow is turning red I must have dropped my yarn and that is why your sweater is not finished!!!!!!!!!!!!!!!!!!!!!!!!!!!!!!!!!!!!!!!!!!!!!!!! I would add: Sandbakkels, bourbon balls, the kitchen is a mess. Oh what fun it is to deal with all the Christmas stress! Ok. Maybe we shouldn’t be quitting our day jobs to start writing lyrics any time soon. There’s a lot going on around here. We’ve got the first of 3 Christmas’ starting on Saturday and I still need to wrap presents. Anything that isn’t done at this point has pretty much been written off. I think my girls will get Valentine’s Day sweaters. (the sleeve of one is pictured above). I’m actually to the neck decreases on this sweater with both sleeves done so it’s feasible that it would be done by Christmas, however I’d like to give each girl their sweater at the same time so no one feels left out. I’ve been working on the blanket for a trade. I call it the Ugly Blankie. It’s ok, it’s just not something I would normally choose to make. I tend to struggle with matching more than 2 colors together. This many colors is definitely a stretch for me. Plus I’m dreading weaving in the ends. I’m on the downhill stretch as I’m knitting it on the diagonal and I just started the decreases. I did finish a scarf that is intended for a friend. I think he’ll be thrilled to get it as he asked me for 2 last year. 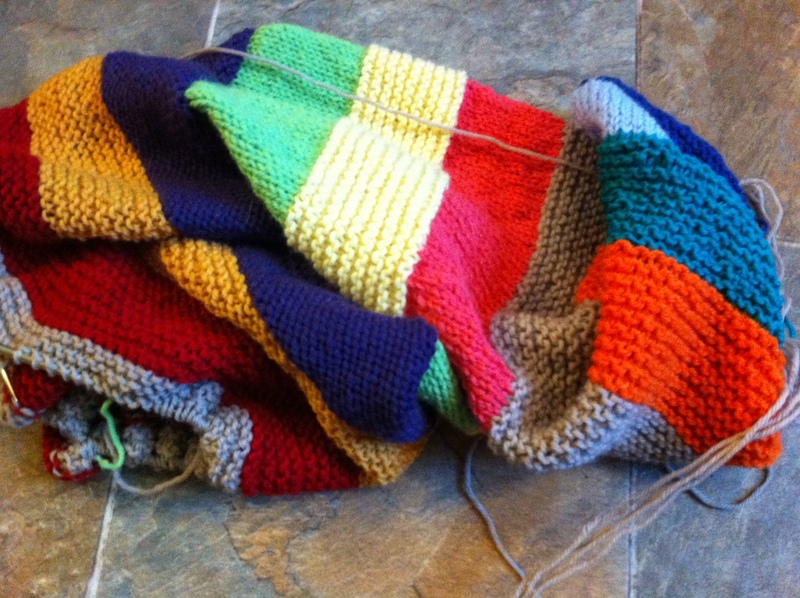 The second one is on the needles and I hope to get lots of knitting done on it in the car on the way to my parents. The second one is made from chunky wool so it’s going much faster. 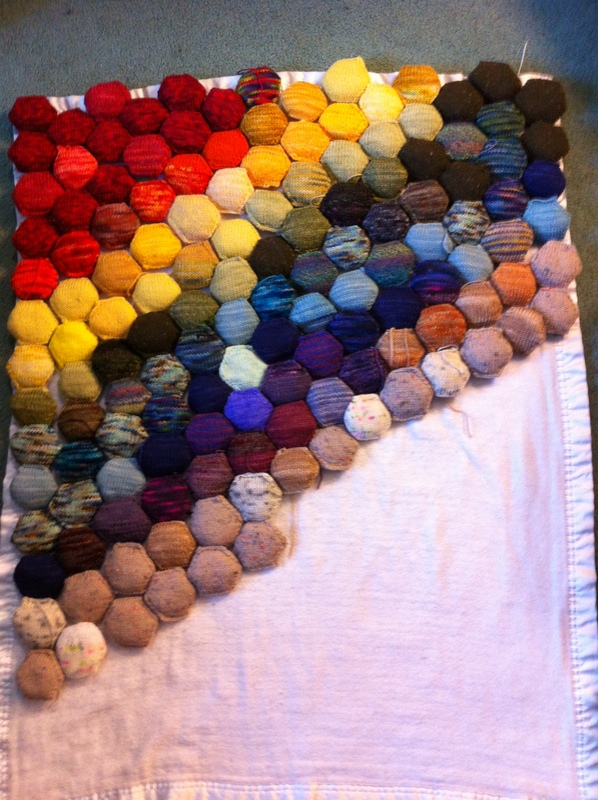 The Beekeepers Quilt is slowly being worked on in fits and starts. I love making the hexipuffs, it’s just a matter of other things taking priority. The nice thing about our Christmas celebrations this year is that they are spread out over an entire week. This gives me a little bit of wiggle room for getting the Beekeepers Quilt done. 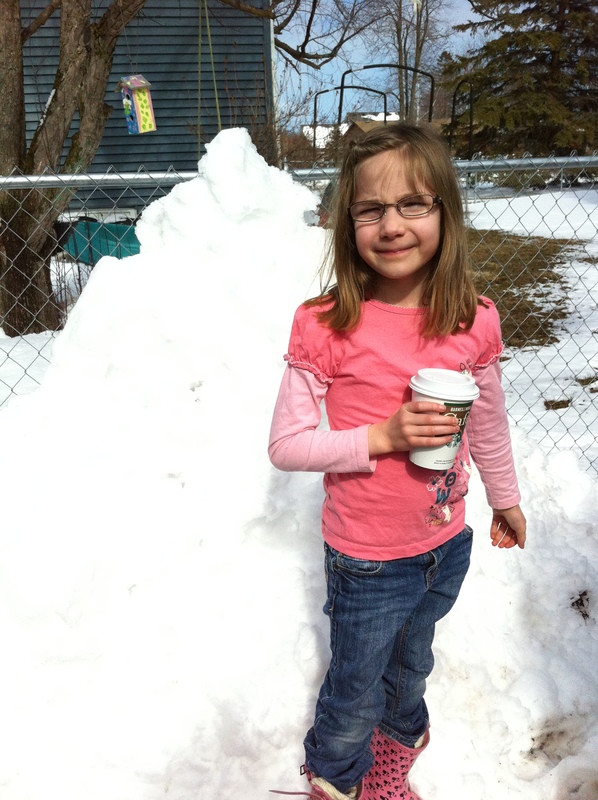 And if it doesn’t get done…. well, there’s always his birthday in February.